The U.S.S. 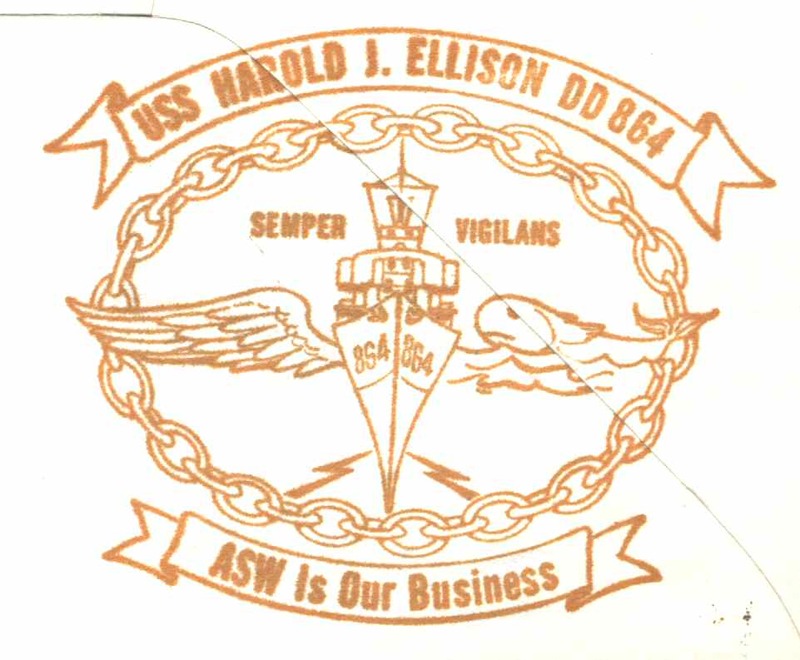 HAROLD J. ELLISON (DD-864) is a Gearing Class destroyer and was built by the Bethlehem Steel Company. 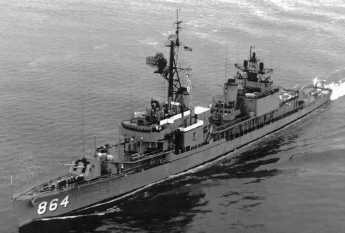 When decommissioned in 1982, the ship was the United States Navy's oldest destroyer in active service and one of the most distinguished of her class. 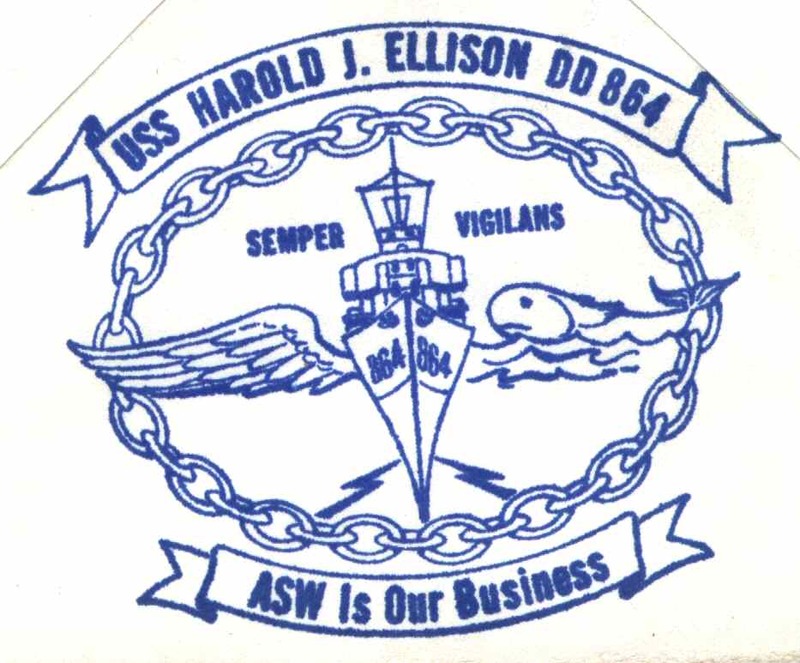 She was named in honour of Ensign Harold J. Ellison, USNR, who was killed in the Battle of Midway. In the 38 years since she was launched at Staten Island, New York, she saw service in many parts of the world including Europe, the Mediterranean and Vietnam. The later included a circumnavigated of the globe. The ELLISON completed a Fleet Rehabilitation and Modernisation in January 1963. At that time, she was equipped with the newest and the most advanced electronics an Anti-submarine warfare weapons. By that date she had also been equipped for and was later on station for two Spacecraft recovery missions, including Gemini 3 recovery operations. 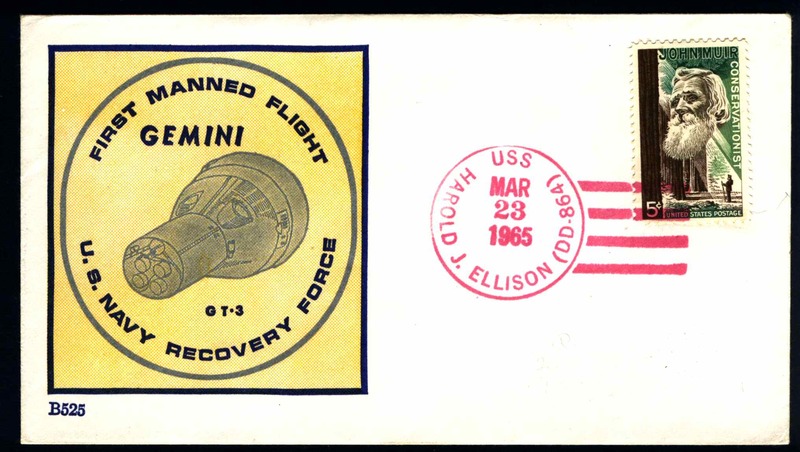 For Gemini 3 she was part of the Pacific Recovery Force. 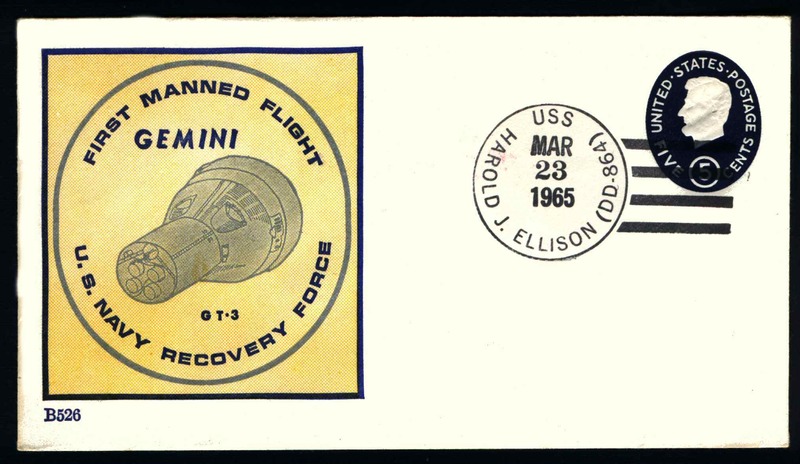 By the start of the Gemini program, Morris Beck's covers and Navy rubber stamp cachets designed by Morris Beck had become so successful that they had displaced many other Recovery Ship cover producers. 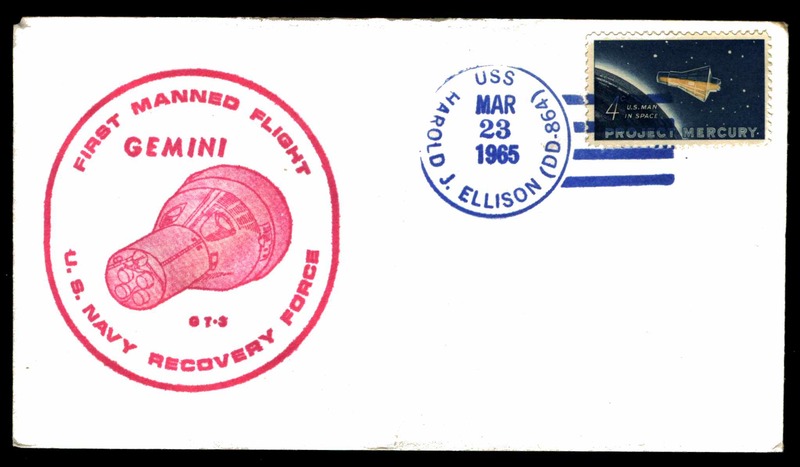 While some cover producers still used general program covers, few still produced specific Recovery ship covers. One interesting sideline is the collecting of the few non-standard covers and variations of the standard covers. 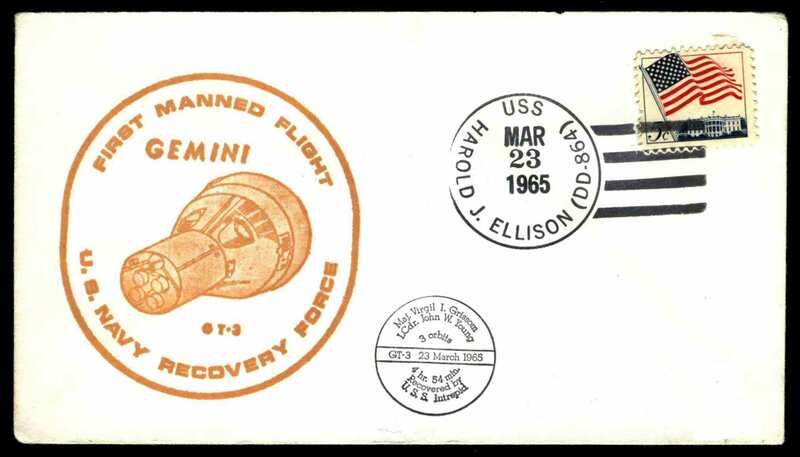 A good example of the later is the cover from the USS Ellison produced for the Gemini 3 mission. Most Recovery Ship covers consist of two main elements, the postmark and the cachet. 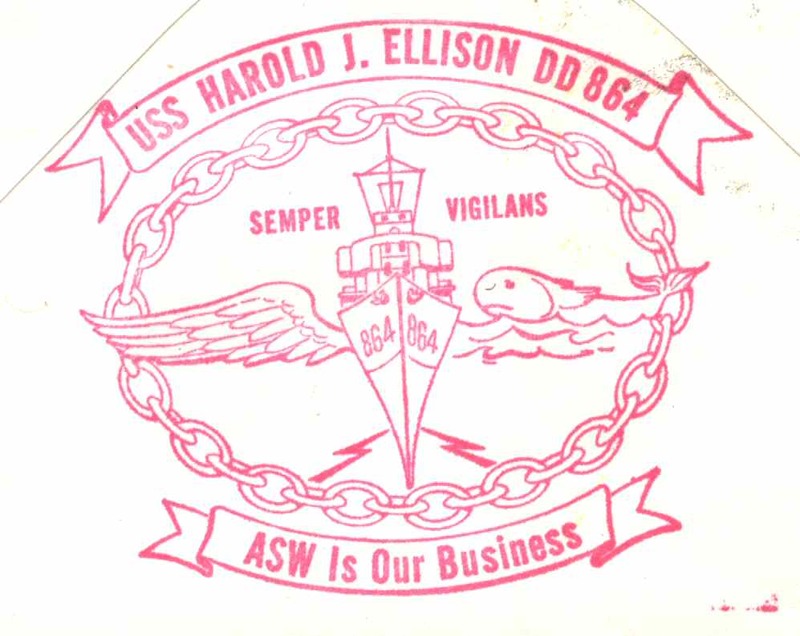 However, USS Ellison covers add an extra element with the ship's cachet, usually applied to the back of the cover, in addition to the Navy or Beck cachet. However, this is only the beginning. Unlike most covers, the three elements appear in a number of colours, making the potential number of combinations quite large. The postmark is known in three colours; black, blue and red. This is highly unusual as most postmarks only occurred in a single colour, usually black, or occasionally two colours. The black and blue postmarks are both common, whereas the red postmark seems to be rarer. A single gold postmark has been reported on a Beck cacheted cover2. The Navy cachet is know in three colours, the common blue one and gold (yellow/brown) one and a less common red(pink) one, while the Beck cover also appears in two varieties, B525 and B526. The two Beck varieties were produced in approximately equal numbers. The ship's cachet is known in three colours; blue, red and gold. The red cachet appears to be the most common. Finally some covers have a small circular GT-3 cachet. 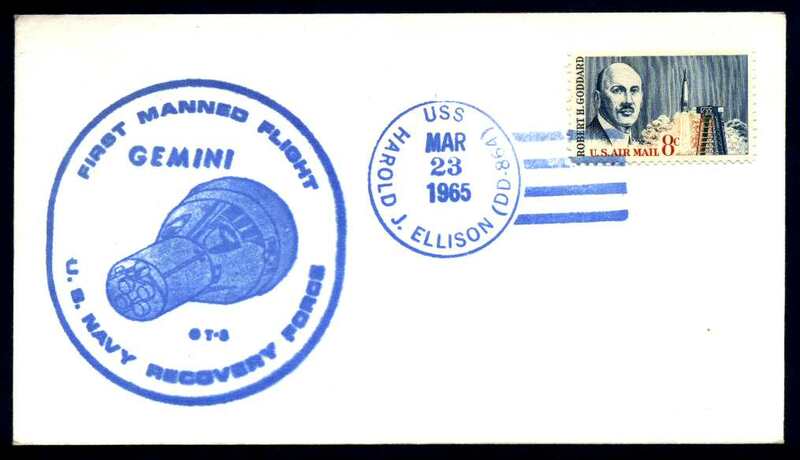 This cachet can also be found on other GT-3 Recovery Ship covers. The follow table shows the combinations I'm aware of. I would like to acknowledge RJI, from whom I've obtained several of the above covers on eBay. Not only do they give excellent service, but they have the widest range of Recovery ship covers I've seen from any dealer, including many non-standard versions. If anyone has a different combination of colours or a completely different cachet please contact me at rossjsmith@optusnet.com.au. This especially applies to anyone with knowledge of a cover with a gold postmark. 2) Discovered on http://beck.ormurray.com. The site speculates that the cover with the gold postmark may be unique and may have been done as a special favour for a member of the crew.